Montreal is witnessing “biggest act of civil disobedience in Canadian history,” according to protest organizers quoted in many local sources of News. [All pictures in this post are taken from the internet (see the text for sources)]. Before going any further let’s get something out of way. A lot of people say Quebec has the lowest tuition fee in Canada. So why are they complaining!? The answer is plain and simple. They have the lowest fee because they have fought for it and they earned it. That is, each time the government proposed increasing the fees or cutting financial aids, students vigorously objected because they saw education to be their right. To learn more about Quebec history of activism and unionism, have a look at this article. For Timeline of the events pertaining to Quebec students protest tuition hikes, this is an excellent source. 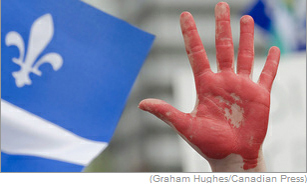 On Friday, May 18th the government of Jean Charest passed the Emergency Bill 78. Under this law an assembly of more than 50 is forbidden, unless police is notified of the itinerary in advance; people should not gather in close vicinity of universities and are not allowed to wear masks! Defiance of this law is punishable by heavy fines. Just two days after the Bill went into effect, on Sunday thousands of protesters filled the streets, this time in defiance of the “unlawful law” and staged what has been described “the largest protest yet.” The protesters and police clashed violently, over 500 people were arrested, at least 20 injured (Source). May 22, marked the 100 days of protest. 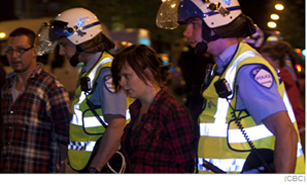 Thousands more filled the streets of downtown Montreal and dozens more were detained. On 23 May, people in several cities in the USA demonstrated in solidarity with Montreal’s student strike and the news was practically all over the world (source). 61 per cent of Quebecers think Bill 78 won’t resolve the crisis. 44 per cent think the government is responsible for the deadlock. On the other hand, Student leaders vow protests through summer. probably not promising news for business owners. And I personally know people who are actually complaining about protesters “disturbing traffic”! But hey, this is history in the making: According to a the Gazette, Montreal’s nightly marches have grown in size since the bill was passed, including a demonstration on Tuesday in which more than 100,000 are estimated to have taken part. This is HUGE and it is not over yet!